While I have used for a couple of years the SOTABeams Band Hopper 4 80/40/30/20m linked-dipole for SOTA activations, I have found this antenna very good as it is light, not needing a balun and after I replaced all the crocodile clips with my choice of connectors (see info later), I found it an easy antenna to switch bands by removing or returning the links between the separate sections. With either a 6 or 10m mast in Inverted-V format the antenna simply works! It wasn’t long before I removed the 80m section as I never activated on 80m. I always carried the extensions with me but have never used them. As more and more activations are now happening on the bands above 20m, I needed to look at an alternative antenna that could cover those bands. As I have moved to Europe, I also no longer need 30m as it’s use is restricted in Europe – the band plan doesn’t allow the use of SSB on the band as it is in Australia. At Freidrichshafen I bought a SpiderBeam-Aerial-51 Asynchronous dipole which operates well enough on 40,20,17,15,12 & 10, but it uses a balun which increases its packed size and weight and as it is not truly resonant on each of the bands. It is a compromise antenna. If you are looking for an antenna that you can simply put up and use, switching bands without having to take out any links, the Aerial-51 is a good antenna, professionally built and in my opinion worth the money. I had thought about making my own Inverted-V linked dipole for the bands above 20m to supplement the SOTABeams one for a while. 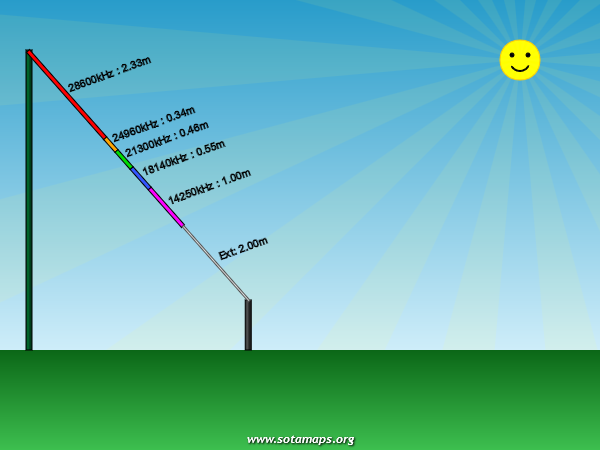 When Rob DM1CM released an online program to calculate the required section lengths for whichever bands you chose (up to 5) on the web here: http://www.sotamaps.org/extras.php – I had no more excuses, I just had to build it! As the title suggests this antenna was to be built from whatever parts I had available. The only newly purchased part for this antenna was some RG-174 (ultra-thin) co-ax to replace the RG-58A/U that I initially used to test the antenna worked as the reduction of weight using the 15m of RG-174 over the 22m (that’s the length it was in the spares box!) of RG-58A/U is noticeable when carrying equipment to a summit! A piece of plastic – ex-parrallel line spacer I think, that I used as the antenna centre piece. An electrical connector block, screwed to the piece of plastic, where the end of each part of the dipole is connected at one side and the coax connected at the other. The links, the points where the length of the dipole is changed to suit the band you wish to operate on, consist of links from a plastic security chain and the same connectors that I replaced the crocodile clips on the SOTABeams Band Hopper – RC 2mm power connectors from Hobby King (http://www.hobbyking.com/hobbyking/store/uh_viewItem.asp?idProduct=66). The wire itself is connector wire from Jaycar (Australian electronics hobby shop chain) part number WH-3001. Nothing special, just what I had. There is lighter wire with teflon in the spares box as well, but I’m keeping that for other projects. The initial version of this antenna was built for 20/17/15/12/10m and I wanted to test it out with a sched with Eric W4EON and Arno W4AKO. Eric was on a SOTA summit, Arno at home – both in Virginia USA. I had tried to get the antenna ready the day before however as I was almost finished, the pulley on the top of the flagpole jammed and it was getting dark, cold and raining. On the day of the scheduled contact, I first had to take the flagpole down, un-jam the rope from the pulley, put the flagpole back up and then finish the calibration work. Interestingly I only had to change the length of one link – the 12m one. Extending this link brought the 12m through 20m dipoles to resonance. As the time got close for the sched I was still outside in the ice-rain completing the adjustments and running the cable back to the shack. I ended-up swearing at the antenna as it kept tangling itself up as I raised it. Something it hadn’t done the 10 times I had raised and lowered it an hour earlier to set the lengths of each section. This problem appears to have been resolved in the final design with the much smaller centre piece which has less area to catch the wind. During the sched I got the possibility to compare the new antenna to my full wavelength 40m horizontal loop at about 1 metre higher. It appeared the new antenna was not as good on 10m but better on 15m. In any case both antennas enabled a difficult contact with Arno W4AKO on 15m but neither managed the harder contact to Eric W4EON/P, which with the background noise here was not surprising. I was happy the antenna was working as well as it could, given the location and packed it up (again in the rain). The antenna was not complete however. Ideally as well as 20-10m, I also need to use it on 40m from SOTA summits. To that end I ran the calculator again but this time for just 10, 20 & 40m – I then took the length for the 20-40m section, extended it by about 10%, cut and added the extensions to the existing antenna and trimmed 7.7 inches off each end until the antenna analyser reported the antenna with all links being in as resonant on 40m. By adding the 40m section, this antenna now covers all HF bands that I am likely to need on SOTA summits and hence I wont need to take the SOTABeams or Aerial-51 dipoles with me (but I will on the first couple of activations – just in case ….). After comparing the lengths given by the calculator against what I found in practice, it appears that the Jaycar hook-up cable is equivalent to the tubing (97%) setting in the calculator. As always several other things effect the actual length of a dipole, even down to how damp the ground is! WARNING: support height and length of supporting end-rope/tie off points affect this antenna! In preparation for my next SOTA activation, rather than using the flagpole to support the antenna, I decided to put up the antenna on the squid pole that I would be using on the activation. This was to check that the mounting of the, now smaller (see last picture in the slide show), centre piece would work on the squid pole and to check everything was still resonant. My analyser now said that some bands were off resonance at the lower height of the squid pole and 15m in particular was some way off. I therefore had to re-adjust various links length and this was after I had already soldered on the link connectors, so it was a fiddley job to do outside in icy winds. The final section length values I ended up with seem to be very close for those given by the calculator for 93% (wire, insulated) rather than the 94% (wire, thin insulation) that I had previously seen. So the moral is that the caluculator is great as a guide but you must adjust the lengths of each section with an antenna analyser and do this with the antenna set-up as it will be on the SOTA summit (i.e. apex height and end-rope lengths as you expect them to be). In any case I am very happy how this antenna has turned out and the real test will be from a SOTA summit from my next activation. Total Cost – € 11 for 25m of RG-174 50 ohm ultra-thin coax (10m of which I still have for “future projects”).